As recently as March 15, the Federal Transit Administration (FTA) expressed its own doubt about two Gateway components: the Portal North Bridge and the Hudson Tunnel Project, by giving both a “medium-low” rating—in essence, a failing grade. In this six-part series, we will examine these new circumstances and discuss other alternatives that could deliver needed results for the region’s rail riders on Amtrak and New Jersey Transit (NJT) in a manner that is more affordable than the current Gateway proposal, which means that it would stand a chance of being funded and built. We will examine the historical background of how we got to where we now stand with Gateway, exactly what Gateway is and is not, and what it would cost to build. We will take a close look at three important components: the Hudson Tunnel Project, a bridge or two that would replace the existing Portal Bridge, and the proposed Penn South Station that would serve as a new stub-end terminal for most NJT trains. The series will conclude with an effort to answer the question: Where Do We Go From Here? It is impossible to comprehend Gateway without understanding its parent projects, which had a life of their own for almost twice the length of time that Gateway has been on the table. The original project was Access to the Region’s Core (ARC), an effort to add extra capacity into New York City, and in one version, to bring some NJT trains to Grand Central Terminal (GCT) on Manhattan’s East Side. There was a separate project, the Portal Bridge Capacity Enhancement Project (Portal Bridge), which was always presented separately—a duality that this writer and other advocates found difficult to fathom. While some aspects of the projects weren’t clear and remain so to this day, the ensuing battle resulted in a triumph of grassroots transit advocacy. ARC was originally proposed in 1995, and its planners considered 137 alternatives for improving rail transit between New Jersey and Midtown Manhattan. Eventually, the choices were narrowed down to three: a link to Grand Central Terminal (Alternative G, which would have NJT trains sharing GCT with Metro-North), a stub-end station below the existing Penn Station (Alternative P) and a non-revenue track that would improve throughput between Penn Station and Sunnyside Yards in Queens for yard moves (Alternative S). This writer was a member of the Regional Citizens’ Liaison Committees (RCLCs) for both the ARC and Portal Bridge projects, as were other transit advocates and community activists at the time. Almost all favored Alternative G, because it would allow NJT customers one-seat-ride access to the East Side. 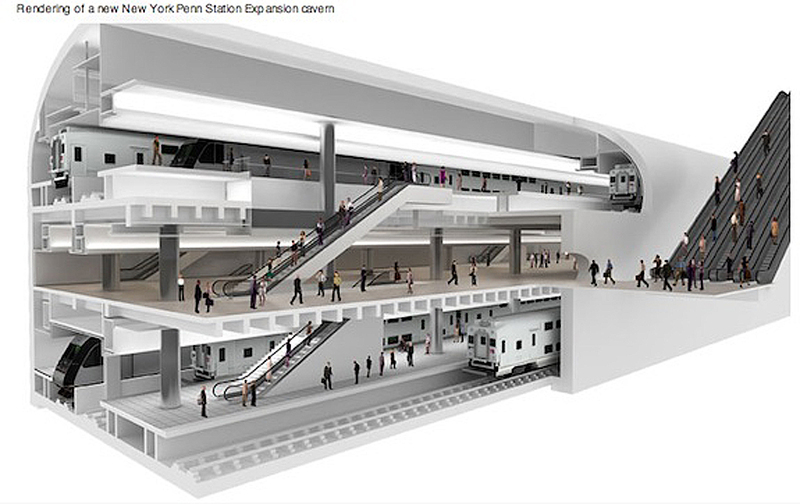 That would have complimented current West Side access to Penn Station. That was the end of the dream of access to a new destination for NJT riders, but there was still hope that the project could deliver redundancy and increased capacity. 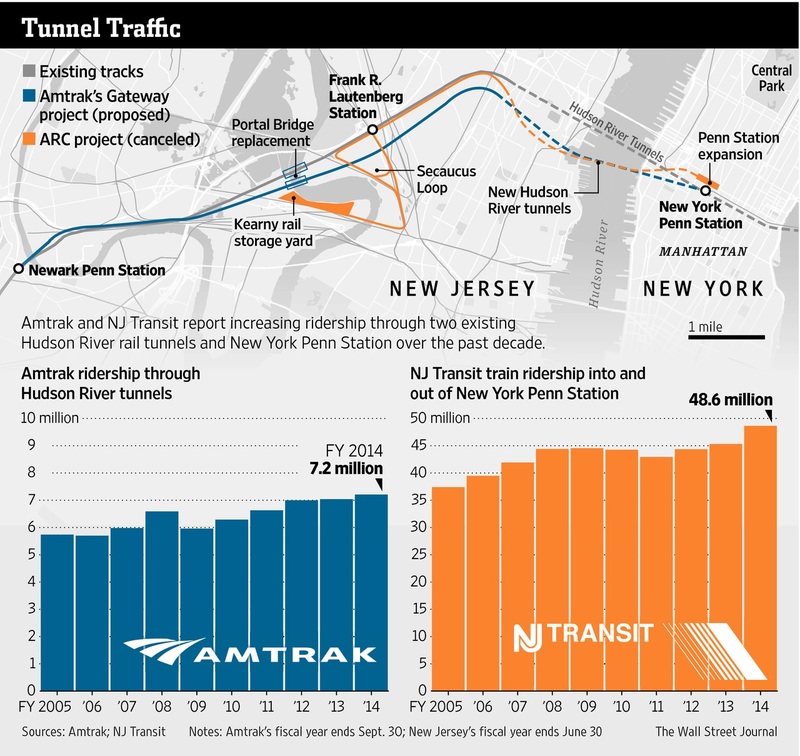 That hope was dashed in 2007, when NJT announced that the agency would build its own tunnel, which it named THE (Trans-Hudson Express) Tunnel, to a new, deep-cavern, stub-end station far below 34th Street. All trains would be directed either to Penn Station or to the new NJT deep-cavern terminal via Swift Interlocking, a complex junction west of Portal Bridge, which is itself west of Secaucus Junction, opened in 2003 as a transfer point between NJT trains operating in and out of New York and those operating in and out of Hoboken on the Main, Bergen County and Pascack Valley Lines. There would be no redundancy or interconnection for the last eight miles into Manhattan. To make matters worse, the new design for the deep-cavern terminal required that all riders traverse 175 feet of below-ground vertical infrastructure—the equivalent of a 17-story building. “Upper” train platforms 135 feet below street level placed on top of “lower” train platforms 175 feet down would have escalators taking passengers to a “mid-level” 155-foot-deep mezzanine, to then connect with elevators to subway level, for eventual egress to the street. It was estimated that it would take seven minutes to get to street level from any of the platforms in that terminal—longer than it currently takes to get from 59th Street to 125th Street on the A or D subway lines. Many advocates and planners had hoped that ARC would result in a true four-track main line between Newark and New York, with its inherent flexibility of operation. Warrington’s plan called for a separate NJT railroad that would never touch Amtrak’s existing NEC, and would direct every NJT train either to the proposed stub-end deep-cavern terminal, or to the existing Penn Station. There would be no independent utility for his plan until every element of it, including the deep-cavern terminal, could be completed. Neither would there be any redundancy improvement (and even that would have been slight) or additional capacity into Manhattan until everything was built and billions of dollars were spent. Many advocates hated the proposed deep-cavern terminal, calling it “a terrorist’s delight” and “THE Tunnel to Macy’s Basement,” even though it would have been located 17 stories below the famous department store. While NJT touted the perceived benefits of the project, the Lackawanna Coalition (of which this writer was and remains Chair) discovered a service plan that would have evicted all NJT MidTOWN Direct trains on the Morris & Essex, Montclair-Boonton and Gladstone lines from the existing Penn Station and forced them into the deep-cavern terminal. NJT denied that the ARC paperwork contained any such plan, and it was correct—having included the service plan in the documentation for the Portal Bridge Project! Citing the inconvenience to its constituents and NJT assigning the new operating plan to another project, the Coalition decided to fight against the now-severely downgraded ARC Project and continue to push for access to the East Side of Midtown Manhattan. 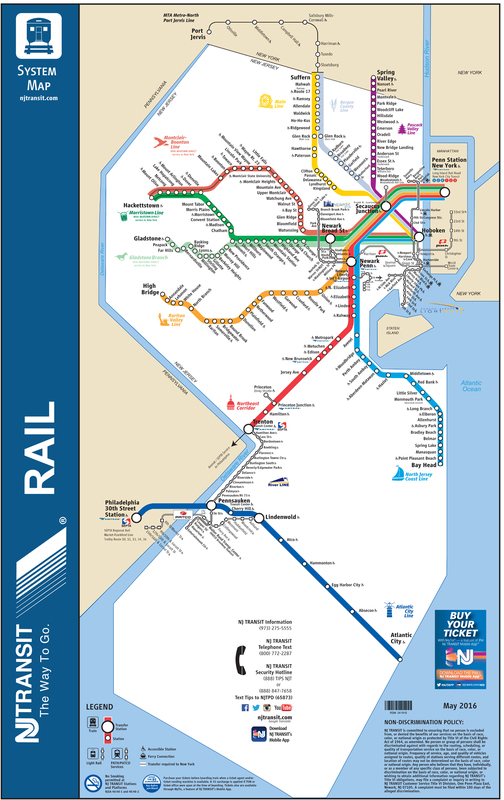 Other advocacy organizations joined the alliance: the New Jersey Association of Railroad Passengers (NJ-ARP) and the Empire State Passengers’ Association (ESPA) in the region, and the Rail Users’ Network (RUN) and the Rail Passengers Association (RPA, at the time known as NARP, National Association of Railroad Passengers) at the national level. Still more advocacy groups from as far away as Chicago and New Orleans joined the alliance, which represented 17 states altogether. That campaign may have been the high water mark of cooperation between advocacy organizations, too. They supported each other in their newsletters and on their websites, gathered to lobby in Washington D.C. or in Albany or Trenton, and caucused together. Longtime advocate Albert L. Papp, a officer in NJ-ARP and RPA for many years, claimed that he gave some papers that detailed the drawbacks of the ARC project to an intermediary, who passed them along to Gov. Chris Christie’s wife, so Christie could review them personally. In short, everybody pitched in. The battle raged for three more years, and the tide began to turn in 2010, even though the FTA had issued a Record of Decision (ROD) in 2009 and construction had begun later that year. Christie, a Republican, had been elected Governor of New Jersey in 2009. He supported ARC at first, but advocates kept pressing their case that the project could not perform well, and certainly would not have been cost-effective. It would not go to the East Side, it would not go to Penn Station, and it would not even connect with Amtrak. Opinion leaders were beginning to change their minds, too. Columnists like Paul Mulshine of the Newark, N.J.-based Star Ledger and Alfred Doblin of the Bergen Record expressed their own doubts about the project, joining the advocates in questioning the project’s cost-effectiveness and desirability. ARC’s cost was climbing rapidly, too. NJT had tried hard to keep its cost, excluding Portal Bridge, to $8.7 billion, an amount that state officials believed that they could raise. They claimed that an additional $400 million for more MultiLevel cars, which would be needed to run the projected service, was not part of the costs, but the proverbial handwriting was on the wall. The FTA issued new cost estimates, which ranged from $9-10 billion to as much as $14.7 billion, for ARC. Christie said that New Jersey could not afford the project at that price, and canceled it on Oct. 7, 2010, 30 days after he ordered that all work be shut down. Transportation Secretary Ray LaHood and FTA Administrator Peter Rogoff attempted to negotiate with Christie and enhanced the package of loans the FTA prepared to offer to New Jersey, but Christie refused to commit the state to repaying those loans. The rest, as they say, is history. It was a monumental change of policy, and a victory for grassroots advocates to defeat a project that the entire business and labor “establishment” and essentially all politicians (both Democrats and Republicans) embraced, but which the advocates sincerely believed would be detrimental to transit riders. The local advocates did not rest on their “victory” after Christie canceled the project. Instead, they attempted to negotiate with the Christie Administration and NJT officials to propose new tunnel capacity into the existing Penn Station and to restore some of the desirable features that Warrington had pulled from the former ARC project. 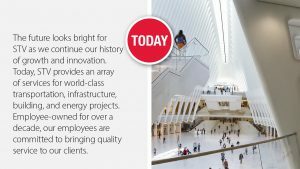 They pushed their “Penn Station First” proposal, which concentrated on new tunnel capacity into Penn Station. While it appeared for a short time that state officials might listen and suggest a new plan, it never happened. Four months to the day after Christie killed ARC, Sen. Frank Lautenberg (D-N.J.) and Amtrak President Joseph Boardman (both since deceased) unveiled the Gateway proposal as a replacement. This writer attended the news conference, which had the flavor of a political event. There was no official presence of any Christie Administration or NJT officials. Later that day, Christie said that he was off the hook about trans-Hudson mobility because Lautenberg and Amtrak had taken the initiative with Gateway. Christie then proceeded to spend much of the available money that would have gone toward ARC on highway projects instead, a move that was controversial at the time and remains so today. We will take a closer look at Gateway, what it comprises and what it would cost, in the next article in this series. * The New York Metropolitan Transportation Authority, parent of Metro-North and the Long Island Rail Road, decided against Alternative G—connecting Penn Station with Grand Central Terminal through a new two-track tunnel under Midtown Manhattan—based on excessive cost and inadequate capacity. An expensive four-track configuration, planners believed, would have been required. As well, NJT and the MTA had little consensus on cost allocation and rider benefits if three railroads—NJT, Metro-North and LIRR—were to share facilities. East Side Access (ESA), which will bring LIRR trains into a new deep-cavern terminal adjacent to and below GCT, was designed this way for technical and cost reasons. GCT has two underground levels, each originally built with turning loops. Metro-North uses both levels and could not afford to lose capacity from sharing existing GCT facilities with LIRR. As well, the turning loop on the lower level was removed from service more than 30 years ago because its radius could not handle modern 85-foot cars. The FEIS (Final Environmental Impact Statement) for ESA determined that it would be far less expensive to tunnel out a deep-cavern terminal in bedrock than disrupting the existing infrastructure (mainly office buildings, as well as GCT itself) to construct a terminal closer to street level. As well, pedestrian flows in GCT would have been overwhelmed by shared Metro-North-LIRR facilities. ESA also provides the opportunity for dual-mode-locomotive-hauled Metro-North trains to serve Penn Station New York and then move on to New Jersey, possibly as far south as Newark International Airport. (There currently is one, an NFL Football special hauled by an NJT ALP46 electric that drops passengers off at Secaucus Junction, where NJT has built a connection to MetLife Stadium in the Meadowlands.) Bringing Metro-North trains through Penn Station New York is still on the table, but it would involve building Gateway’s two new Hudson River tunnels as well as a train storage yard in New Jersey. Existing MTA EMU (electric multiple-unit) trainsets cannot operate west of Penn Station New York. NJT’s relatively new ALP45DP dual-power locomotives, which operate with AC catenary traction power or diesel, could provide needed flexibility. 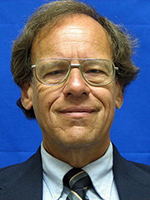 David Peter Alan is Chair of the Lackawanna Coalition, an independent non-profit organization that advocates for better service on the Morris & Essex (M&E) and Montclair-Boonton rail lines operated by New Jersey Transit, as well as on connecting transportation. 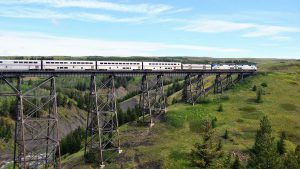 The Coalition, founded in 1979, is one of the nation’s oldest rail advocacy organizations. In New Jersey, Alan is a long-time member and/or board member of the NJ Transit Senior Citizens and Disabled Residents Transportation Advisory Committee and Essex County Transportation Advisory Board. 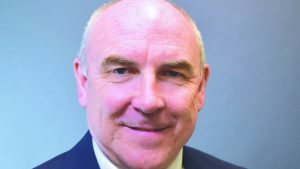 Nationally, he belongs to the Rail Users’ Network (RUN). Admitted to the New Jersey and New York Bars in 1981, he is a member of the U.S. Supreme Court Bar and a Registered Patent Attorney specializing in intellectual property and business law. Alan holds a B.S. in Biology from Massachusetts Institute of Technology (1970); M.S. in Management Science (M.B.A.) from M.I.T. Sloan School of Management (1971); M.Phil. from Columbia University (1976); and a J.D. from Rutgers Law School (1981).